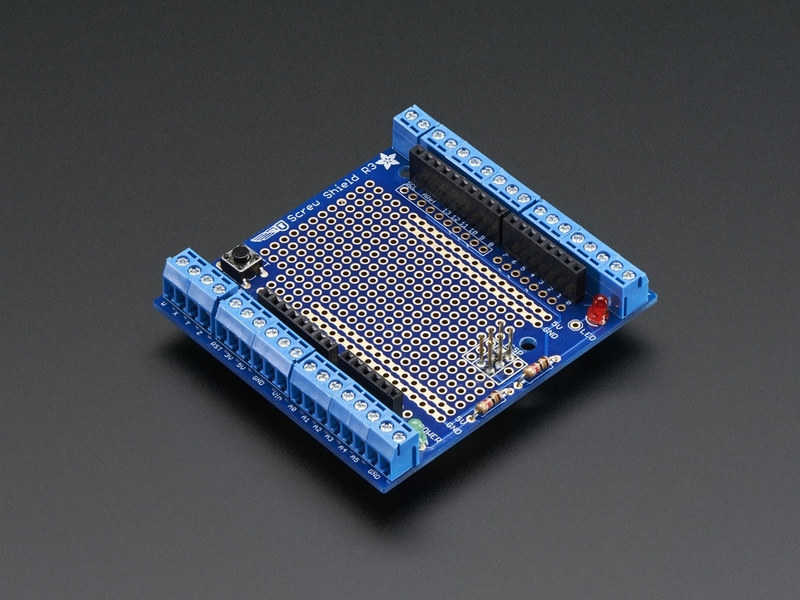 The next generation Proto-ScrewShield is a dual-purpose prototyping shield. Now only does it have a large 0.1" grid prototyping area but it also extends the Arduino pins to sturdy, secure, and dependable screw terminal blocks. You even get a few bonus terminals for extra GND and four 'free' terminals for whatever connections you wish! New! 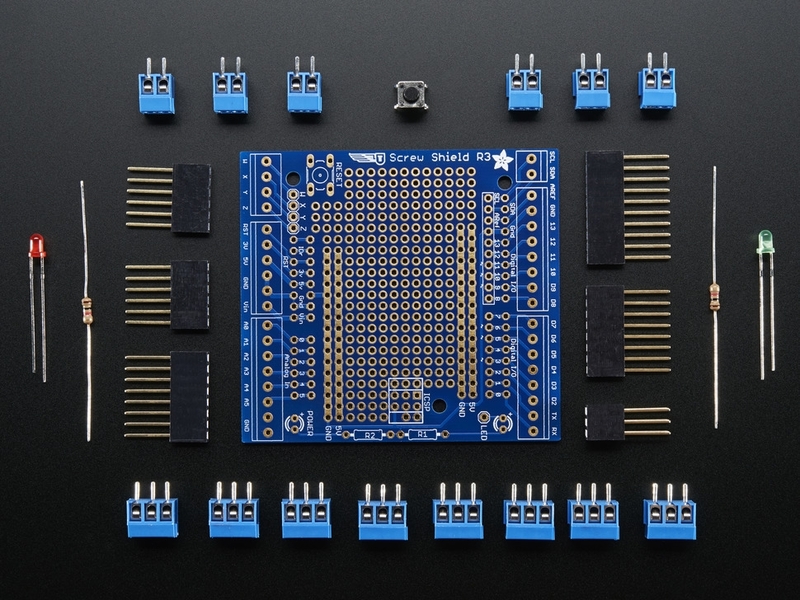 As of June 23, 2014 we now have an R3 update to this design - we now have a stacking header for the ICSP 2x3 pins and breakout the SCL and SDA pins. It now works much better with R3 UNO's, Mega, Leonardo, as well as stacking nicely with any shield. 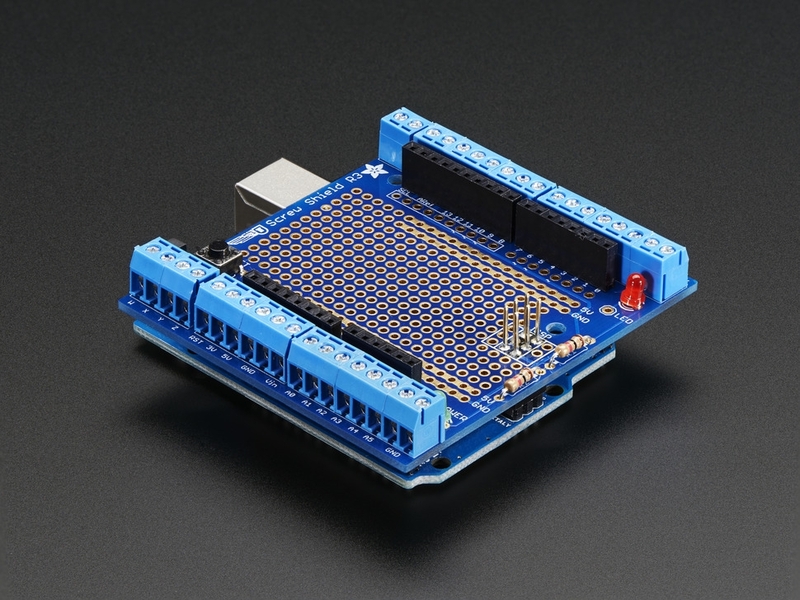 The stack-able wing design allows you slip this under any shield and still get easy access to the "analog" & "digital" ports of the Arduino. The ScrewShield can be stacked above or below pretty much every other shield. Comes as a kit of all through-hole parts. You'll need to assemble the kit using a soldering iron, diagonal cutters and solder but its an easy kit and should take less than half an hour. For more information, instructions, and tips check out the Screwshield page - this page is for an older version but the overall instructions are the same.